For thousands of years, humans evolved to live and work outdoors. Our hunter-gatherer instincts evolved to function within the natural environment, but the demands of contemporary life have now brought most activities indoors. Economic constraints and the desire for environmental control have led to a tendency towards spartan uniformity in most building designs, with little regard for connection to the outdoors. However, this trend has wrought consequences on our collective mental health; now, depression and anxiety rates are higher than ever - especially among city dwellers. To correct this, designers must rise to meet the challenge of creating spaces that are restorative to mental and physical health, as well as functional and aesthetically pleasing. New evidence is emerging that regular exposure to plants may reduce stress, fortify mental health, and boost productivity. This concept is not new; the practice of forest bathing has proven highly useful to the health of Japanese nature lovers for centuries. Yet, making time for immersion in nature can be difficult in a world where modern demands necessitate more interaction with backlit screens than open air, so the emergent solution seems to be bringing the great outdoors into the indoor environment. Although this movement is still in its early stages, research is showing that the use of nature-inspired design principles and natural materials in buildings can facilitate a sense of comfort, wellness, and relaxation in their occupants that may lead to groundbreaking neurological benefits. Applying biophilic principles to interior environments facilitates mental restoration, reducing stressors from a variety of environmental factors for other population groups in addition to beleaguered office workers. Studies have even shown that providing outlets for outdoors-focused activities such as gardening and beekeeping through the Sustainability in Prisons Project creates a sense of hope and greater opportunities for rehabilitation among inmates at Rikers Island, despite the limited and potentially stressful prison environment. In a study by researchers at Sweden’s Chalmers University of Technology and Gothenburg University, providing access to a garden and other natural features was among the design techniques that led to a proven reduction in patient aggression at Östra Hospital’s new psychiatric care facility. Research such as this is beginning to make the case that designing with nature brings numerous benefits in mental health for all demographics, which can be transformative for those who need it most. Green building standards are beginning to evolve to acknowledge this shift in thought. First released in 2014, the WELL Building Standard outlines a set of metrics for designing buildings to promote mental and physical wellness in their occupants, transforming mundane spaces into restorative environments. Biophilia comprises a significant portion of the WELL Building Standard, awarding credits for visual connections to nature and other biophilic design standards. This includes not only green walls, nature views, and office plants, but also integrating natural forms and materials. Static elements, such as structural or decorative interior trees, can be a low-maintenance and long-lasting way to bring the biophilic spirit into any enclosed space. Even if the momentum for WELL-certified buildings takes years to fully build, the standard is still already a valuable tool within the building industry by providing guidelines for wellness-oriented architecture as more project teams learn about the process and move towards certification. Trees and other visual connections to nature are a simple way to bolster building wellness. From prison cells to corner offices, biophilic design is an accessible and equitable way to improve physical and mental wellness in interior environments. Although the rapid pace of modern city life can limit opportunities for healthful excursions into nature, a building’s end-users can still receive its benefits when designers build tangible connections to the outdoors within the walls of everyday spaces. Natural materials and finishes are often more readily available, environmentally friendly, and abundant than steel, concrete, and other energy-intensive alternatives. With so many products and options available, incorporating biophilia into building design can be a visually striking and sustainable way to adapt the authenticity and beauty of natural resources into tools for healing. 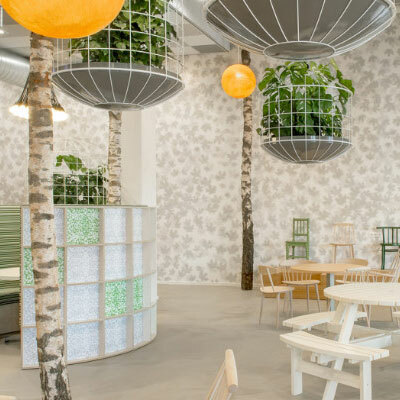 Making the choice to bring the outdoors indoors in a building is also making a statement about the paramount importance of its occupants’ health and wellness.